It took the desire and dedication of a few very determined individuals to start an award-winning Thoroughbred adoption program at the Finger Lakes Gaming and Racetrack. It also took the vision of the Finger Lakes Gaming and Racetrack and the Horsemen's Benevolent Protection Agency to see that something needed to be done about of the future of the racehorses whose racing careers were over. In May of 2006, Finger Lakes Thoroughbred Adoption Program obtained 501(c)3 certification, paving the way for tax deductible donations which include not only the donated Thoroughbreds, but supplies, equipment, services, and cash. Support and funding for the project came from a variety of sources. Delaware North Companies, the parent company of Finger Lakes Gaming and Racetrack, donated the two acres of land on which the barn is located. 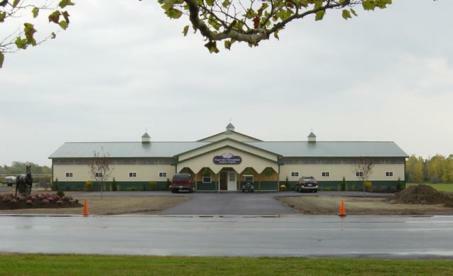 The construction of the barn was made possible through $60,000 in state funding secured by New York State Senator Michael F. Nozzolio, as well a grant from the American Humane Association. A significant amount of additional funding was generously provided by Wanda Polisseni. Ground breaking The Purple Haze Center, named for Wanda Polisenni's Purple Haze Stables, took place in June 2007 and the center opened in early November when the first FLTAP horses took up residence. FLTAP ended 2007 with being presented the prestigious Lavin Cup Award on December 4th at The American Association of Equine Practitioners 53rd Annual Convention in Orlando, Florida. Phyllis Shetron, FLTAP Board Treasurer, and Dr. Margaret Ohlinger, co-founder, traveled to Orlando to accept this honor on behalf of FLTAP. The AAEP annually honors “a non veterinary individual or an organization that has demonstrated exceptional compassion or developed and enforced rules and guidelines for the welfare of the horse.” Some past recipients of the Lavin Cup include the Thoroughbred Retirement Foundation, Inc., the Professional Rodeo Cowboys Association, Days End Farm Horse Rescue, and the Thoroughbred Charities of America. The Purple Haze Center is a 10,000 square foot state-of-the-art horse barn that can house up to 16 Thoroughbreds in its 12 x 12 foot stalls. All the stalls have cushy rubber mats on the floor and very quiet sliding stall doors. The stall doors have fold-down fronts that allow the horses to hold their heads outside their stall and look around and interact with barn visitors. Additionally, three 12 foot long vision slots were crafted between stalls to create a pleasant open-air environment which, along with the spacious 14 foot wide roughened concrete aisle, safely provide horses with what simulates a herd-like environment. With safety bars across the windows in each stall, horses are able to look outside and enjoy the fresh air from outdoors. To alleviate boredom and facilitate retraining, there is a 70 x 72 foot riding arena as well as four 60 x 60 foot paddocks for turnout. The recent addition of two 60 foot round pens allows the horses time on grass. A wash stall, a large utility room, a heated bathroom, and office with soothing lavender painted walls complete the facility. Great attention to detail is given for the comfort and safety of the horses housed at the Purple Haze Center, right down to the purple feed buckets. Over 400 Thoroughbreds have found new homes and new careers through FLTAP. Group tours of the FLTAP Purple Haze Center are available. Click here for details.